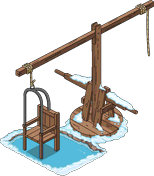 The last 24 hours for Dunking Device, Large Iceberg, Medium Iceberg, Small Iceberg and Giant Burning Goat are here! I never figured out how to spend my coupons from catching the elf. Wish they would offer the prizes I did not get to, like Dunk a Monk, for donuts. Next Winter 2016: Last 24 hours for limited time items!